In November, I watched my sister get married alongside my entire family, including my grandmother, Doreen. It was rare glimpse of unfiltered joy and celebration from a woman whose life has been a series of battles; against the state, against widowhood, against poverty, against mental illness, and now against Alzheimer’s. I thought of this as I watched her from the top table, and I thought of the other women in every single corner of this country whose lives haven’t been theirs to live. 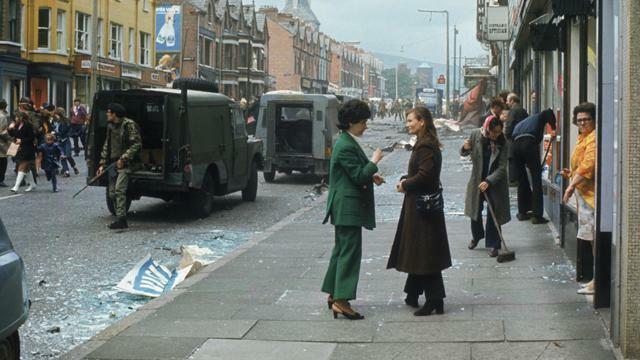 The notion of women in a role of emotional labour, peacekeeping, and aiding reconciliation seems embedded into the canon of the conflict; the old Kathleen Ni Houlihan and Mother Ireland symbolism adapted for the changing times. While the men went out to fight, the women hid their bombs and fed their children, with a clean kitchen and an unwavering smile. Of course, this is a vast generalisation; some women participated in more active roles across the island, but it is the men of the conflict who are overwhelmingly celebrated in song, in art, and in literature. Towards the end of The Troubles, Lorraine Dowler conducted interviews with nationalist women in Belfast and examined their resentment at being confined to homelier roles. A woman named Roisin described her home as a prison. Roisin’s sentiment is one that I recognise from conversations with my own grandmother, who was herself interviewed for The Independent in 1993. This is exactly why the image of the jubilantly happy older woman in Northern Ireland is striking to me, because it is seldom seen. When we do see it, it’s almost always susceptible to mockery and parody, with characters like May McFetteridge and Give My Head Peace’s Ma embodying this trope of the wacky working class Northern Irish matriarch. Think of the cultural perceptions of bingo halls and those who inhabit them. Their actual lives are such a mystery that there was a study conducted on the meaning and lifestyles of elderly women who play bingo every week. We are not privy to older women’s emotions except when they’re mourning, or telling us about the fear instilled in them by threats of violence. These instances tell us that our older women are valued most by our media and our culture when they’ll recall their trauma on demand for someone’s teatime viewing. There is a reason we feel compelled to react sadly to seeing older women alone in cafes and on buses; we see them as frail, lonely, and weak. I want to make a case that these images should not induce pity. Rather we should celebrate the independence and persistence of these women; they’re not only strong because they’ve endured years of hardships, they’re strong because after those years they’re still striving to celebrate the joy of living. There is little research on the impact of the conflict on the mental and physical health of Northern Ireland’s older women specifically, however a 2016 survey found that 20% of all Northern Irish women suffer from mental health issues, with a study conducted by Ulster University projecting that half of these cases are a direct result of the Troubles. By 2025, the number of adults aged 65 years and older will account for a fifth of Northern Ireland’s population. Taking this into consideration, alongside the 2011 census’ confirmation that women are living longer than men; why shouldn’t those lives be visibly and unashamedly fulfilling? The morning after the wedding I pattered wearily, hungover, down the corridors of the hotel toward the pool. Immersing myself in the warm water, I watched as a group of older women with fantastic silver hair congregated around heated chairs. I had no idea if they had been hurt in the same way as Doreen, and I knew nothing of their background, but I knew I wanted more than anything for them to be happy.